Information systems : success in the 21st century / Uma G. Gupta. Material type: Book; Literary form: Not fiction ; Audience: Specialized; Publisher: Upper Saddle River : Prentice Hall, c.2000Availability: Items available for loan: [Call number: 658.4038 GUP] (1). Material type: Book; Format: print ; Literary form: Not fiction Publisher: Boca Raton : CRC / Taylor & Francis, 2006Online access: Publisher description Availability: Items available for loan: [Call number: 551.480285 KUM] (1). 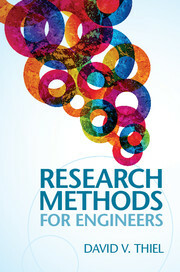 Research methods for engineers / David V. Thiel. Material type: Book; Literary form: Not fiction ; Audience: Specialized; Publisher: Cambridge : Cambridge University Press, 2014Online access: Cover image Availability: No items available Checked out (1). Pavement analysis and design / Yang H. Huang. by Huang, Yang H. (Yang Hsien), 1927-. Edition: 2nd ed., International ed.Material type: Book; Literary form: Not fiction ; Audience: Specialized; Publisher: Upper Saddle River : Pearson / Prentice Hall, 2012Availability: Items available for loan: [Call number: 625.8 HUA] (2).